Put the brakes on a boring Father's Day with these dream wheels! 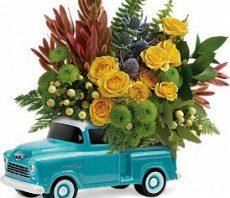 Hand-painted and hand-glazed, this ceramic Chevy pickup delivers a bounty of beautiful roses and blooms, just for dad. 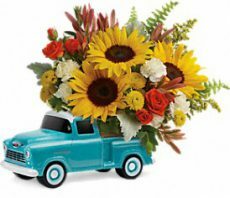 It's one of the ways to commemorate the 100th Anniversary of Chevrolet Trucks! 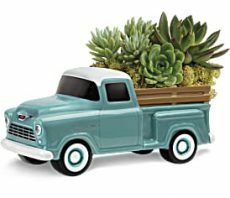 Celebrate dad with a gift he'll enjoy long after Father's Day: Gorgeous green echeveria, planted in the back of this charming ceramic Chevy pickup. Hand-painted and hand-glazed, it's one of the ways to commemorate the 100th Anniversary of Chevrolet Trucks! Large green echeveria succulents are arranged with reindeer moss.